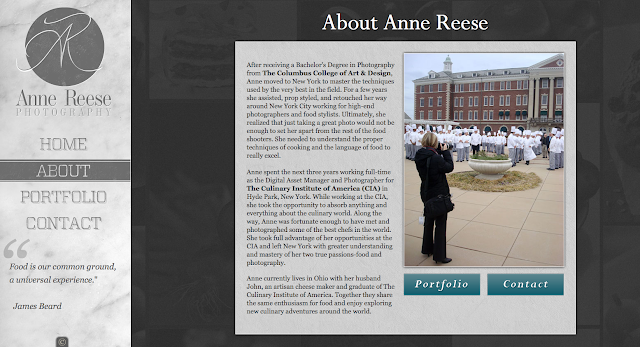 We launched a new website for Anne Reese Photography today and it can be viewed at http://www.annereesephotos.com/. TBH Creative worked with Anne Reese Photography this Fall to help with her new website. Anne hired TBH Creative after consulting with another firm for 1 1/2 years and not seeing results. We were able to reuse the basic design ideas as a starting point. From there, we coded and paid special attention to browser compatiblity which was very important to Anne. We included some JQuery to re-scale photos based on screen size, allow for scrolling and pop up window for a larger view. 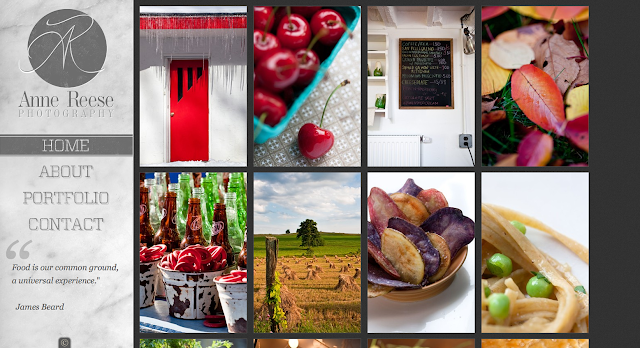 We also developed a custom application to help her manage her photos into categories and random display. With her software, she can upload photos that will resize and arrange as she specifies into the front-end design. Anne Reese Photography's homepage. View the site. Here is an interior page from Anne Reese Photography's website. View the site. After receiving a Bachelor's Degree in Photography from The Columbus College of Art & Design, Anne moved to New York to master the techniques used by the very best in the field. For a few years she assisted, prop styled, and retouched her way around New York City working for high-end photographers and food stylists. Ultimately, she realized that just taking a great photo would not be enough to set her apart from the rest of the food shooters. Anne spent the next three years working full-time as the Digital Asset Manager and Photographer for The Culinary Institute of America (CIA) in Hyde Park, New York. Along the way, Anne was fortunate enough to have met and photographed some of the best chefs in the world. She took full advantage of her opportunities at the CIA and left New York with greater understanding and mastery of her two true passions-food and photography.